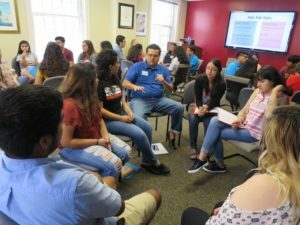 Mentors work with Northern Virginia high school seniors to help them prepare for and apply to college. The mentoring program meets on Wednesdays, from 5:00-7:00 (except holidays) in Arlington from October – April. Mentors may also maintain communication with their mentees between meetings. Training and guidance is offered throughout the year. Email mentoring@dreamproject-va.org for questions or fill out the Mentor Interest form. Please note that mentors will need to submit to a background check. The Alumni Mixer is an annual event where we invite all of our newly graduated Scholars to network with seasoned professionals in our community. As our Scholars become Alumni, the challenges they face as Dreamers change dramatically. Entering the work force and gaining the skills to make themselves marketable to employers during this difficult political climate can be challenging to our Alumni, especially for those who may not have the same experience working in full time jobs, internships, or research assistantships as their documented peers. Our Mixer is an opportunity for us to connect our Alumni with people established in their fields looking to hire Dreamers, and facilitate the delicate life transition from student to employee. If you would like to help a Dreamer start their career, come to our Mixer to talk to an alum about how they can break into your field! Scholarship applications are posted in February/March and are due in April/May. Volunteers are needed to help score written applications to determine which applicants will be interviewed and to participate in interviewing the candidates. Our fundraisers and events are community affairs! We often need help planning, coordinating, cooking, setting up, taking down, etc. This is a great opportunity to spend time with our mentees, scholars, and their families. The Dream Project Board is an all-volunteer, working board. We welcome community members who wish to contribute as board advisors or on board committees. If you would like to help build and strengthen our Dream Project community in any of these areas—or other areas where you have talents—then please fill out the web form on our Contact Us page, and someone from the Dream Project will contact you.